In 2018, Kenya Connect launched the first ever Library Card program in Wamunyu with parents enrolling their children to receive a library card for one dollar. 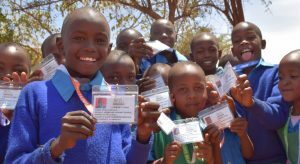 These student specific cards connected to an “I Love Reading” lanyard, allow students to borrow books from the Kenya Connect Library of over 6,000 books in English and Kiswahili. Currently over 1,000 cards have been issued at 10 of our partner schools with plans to expand the program to all 55 partner schools. Creating bookmarks, dramatizing stories, using a Kio Kit tablet and playing vocabulary games are all activities that are included in our special Book Days held on a regular basis at the LRC or partner schools. Designed to “make reading fun” these Book Days provide hands-on activities and interactive games to promote reading. 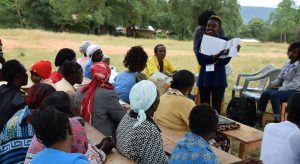 Teachers in Wamunyu are at the forefront of our literacy initiatives. Since the opening of the LRC, professional development sessions have been held by visiting teams guiding teachers on how to use beautiful picture books, early chapter books, and information books as supplements in their classrooms. Most teachers, never having books to use in the classrooms, learn about the importance of out-of-class reading and ways to encourage reading at fun interactive workshops. Parents in Wamunyu are committed to education and want to see their children succeed. Kenya Connect staff and volunteers have been conducting parent sessions to share the importance of reading and provide tips and ideas of how to nurture reading, even if the parents are illiterate themselves. Encouraging the parents to have their children read to them or to look at a book together encourages reading. A variety of ideas are offered and we are in the process of putting together a pamphlet for the parents to take home. Many homesteads are without electricity and use dirty kerosene in a can to provide light. In 2016, Kenya Connect initiated a rent-to-own solar light program with families paying $1 a month for 8 months. As the lights are distributed, students are also given a log sheet to record how they are using the light…. for reading, studying or another activity. This initiative coupled with being able to borrow books means students can now read at their homestead. 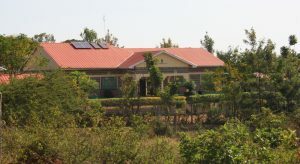 In 2012, Kenya Connect opened a Learning Resource Center with a computer classroom with 28 computers, a LCD projector/screen, and access to the internet. For most students and teachers in Wamunyu, it was the first time to see or use a computer. Director of Educational Technology and ICT, Patrick Munguti, has been leading our technology program and created and teaches an eight week basic computer class. This class includes the basics – how to turn on the computer, use a mouse and type on the keyboard, word processing, and how to access the internet. Through interactive exercises, students and teachers are brought into the world of technology preparing them with 21st century skills. 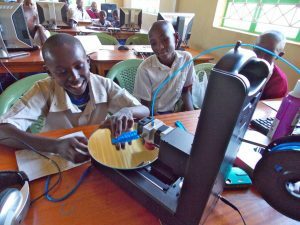 Imagine the thrill of using Computer Assisted Design to create a 3D printer solar light in conjunction with students in the U.S.! 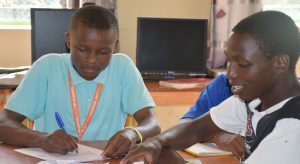 Kenya Connect has been partnering with Level Up Village to offer innovative STEAM (Science, Technology, Engineering, Art, and Math) classes by connecting a class of students in Wamunyu with students in the U.S. Since 2015 over 800 students have participated in classes including Global Inventors, Global Conversations, and Coding Video Games. 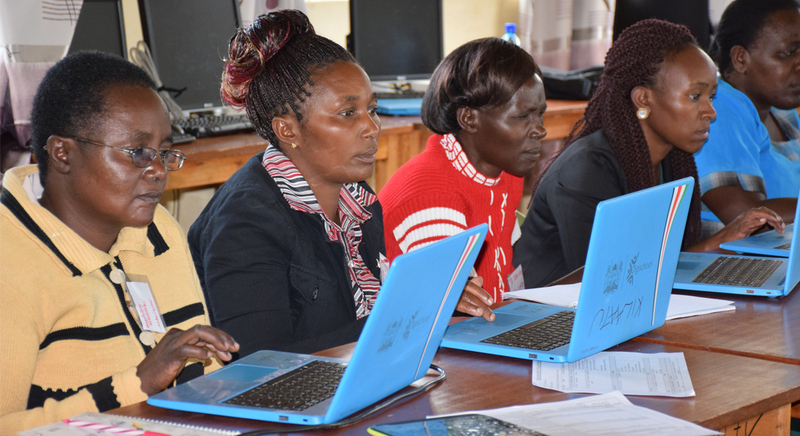 Kenya Connect has been the leader in providing technology professional development for teachers in Wamunyu and the Kyaithani Cluster of Kitui. In 2017, primary schools were given a laptop, projector and 40 tablets to use in Level 1 and Level 2 classrooms issued by the Kenyan Government. However, the teachers were given limited training and most of this valuable technology was locked in classrooms since the teachers were scared to use it. As a result, the KC team sprung into action and began conducting multiday workshops for teachers on how to use the technology while also providing technical support if the teachers ran into challenges. In addition, Kenya Connect has provided additional resources including the use of content-rich Rachel Plus Devices. Secondary School is not free in Kenya and some students in Wamunyu are unable to attend Secondary School due to lack of funds. The School Fund is a funding platform for NGO’s like Kenya Connect to help students who are top academic achievers and living in extreme poverty. Over 40 students have been funded through The School Fund. In an effort to further support these students, Kenya Connect provides enrichment programs during school breaks including study sessions, leadership development, geocaching clubs and field trips. 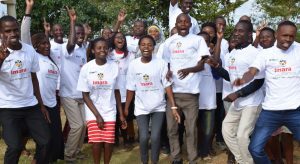 In 2016, Kenya Connect was awarded a grant from the U.S. Embassy for a 2 year Leadership Program for Secondary Students. This program, designed to strengthen English and academic skills and provide leadership training, was a unique opportunity for students in our village to meet with other students from around Kenya to empower them to be future leaders in their professions and country. Part of the program also provided U.S. Fulbright Teachers to work in KC partner secondary schools teaching English and assisting with these assessment programs. The U.S. Embassy awarded a second grant to Kenya Connect to establish Peace Clubs at three of our secondary schools. Twenty one students were selected to be Peace Ambassadors of the three clubs with the task of assisting with conflict resolution and creating peaceful environments at the school. “Stand-up and shake out your wiggles! 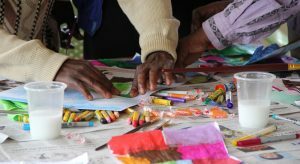 It’s time for a brain-break” Since the opening of the Learning Resource Center, Kenya Connect has offered over 15 workshops led by visiting U.S. teachers. These workshops have been designed to offer tools and ideas to teachers on how to use best practices to implement the Kenya Curriculum and develop 21st century learners. Providing ideas, modeling movement, kinesthetic learning, arts integration, and critical thinking and creativity lessons have given over 200 teachers in Wamunyu new ideas on how to energize their classrooms for improved learning. The visiting teams have also focused on literacy demonstrating how to use beautiful picture books, early readers, and information books in the classroom. How best to empower teachers? Kenya Connect piloted a Professional Learning Community in 2018 with 16 teachers from four school clusters. These teachers met on a regular basis with Board Member and retired teacher, Laura Carter, to develop strategies to best implement the Kenyan curriculum. Using movement, art, storytelling and manipulatives, the teachers shared ideas on how to best encourage 21st century learning in the classroom. These teachers also joined a “WhatsApp” group on their phones. The “WhatsApp” allows them to share ideas, pictures and videos with one another on what they have tried implementing in their classrooms and how the students responded. Kenya Connect is keenly aware of the challenges that the girl child face in Kenya. Many parents still support their sons for further education over their daughters and girls are directed to become mothers, farmers, and teachers and not always encouraged in all fields. In all Kenya Connect activities, we have ensured that there is equal representation of girls in all leadership programs including ACCESS, Peace Clubs and The School Fund. As we have grown our staff in Wamunyu, we have been intentional in hiring women who serve as role models and inspiration for the girls. Our library is filled with books sharing stories and biographies of strong and accomplished women around the world. Our staff and boards discuss on a regular basis of what more we can do and we are constantly seeking new avenues and interventions to help the girl child in Kenya. 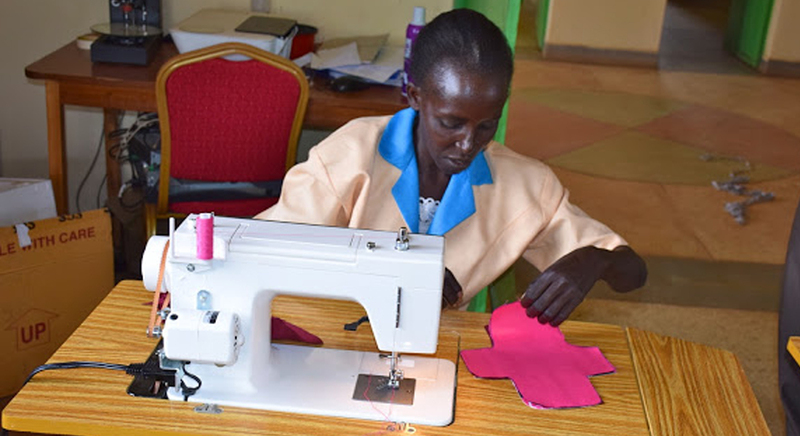 Wings Poa, Kenya Connect’s Reusable Sanitary Pad program, is helping girls stay in school during their menstruation. An issue that had been raised by the Head Teachers, we began seeking a solution to help girls stay in school. One of our Board members worked to develop a prototype, and thanks to grants by World Help and Caring Crowd, we launched the program with the purchase of three sewing machines, PUL fabric, and other supplies and women from the local Kithito Kya Kyeengai women’s group and students at the Wamunyu Special School creating the kits. When the kits are distributed, students and mothers are invited to learn more about menstrual health and hygiene and to learn about the new reusable kits from staff members and volunteers. We learned through surveying girls at two of our participating schools that 85% of the girls missed 3-4 days of school each month. After using the kits for 3 months, we learned that only 5% of the girls were missing school when they had their periods. We are thrilled with these initial results and have distributed 190 kits at 6 schools. Kenya Connect also partnered with Afrocloud Technologies to create a digital curriculum that is being piloted with a few primary school students. We will continue to provide updates on this exciting program, but in the meantime, we invite you to CLICK HERE to watch a video to learn more about the Wings Poa kits!